Flipkart and Amazon are going all out to woo the next 100 million users that they believe will come from tier-II and tier-III markets. Bengaluru: The number of new users in India’s $18 billion online retail market has surged this year rebounding from 18 months of sluggish growth, as cheap data, faster internet connections and proliferation of smartphones made online shopping accessible to people in smaller cities. The top two online retailers, Flipkart and Amazon India, contributed to the bulk of the growth. At least four executives at both Flipkart and Amazon said new user growth, a key indicator of the health of the industry, climbed more than 50% in the past year. The performance of Flipkart and Amazon is an indicator that the pace of growth has accelerated in India’s e-commerce market after a rebound in the second half of last year. Both have subscription plans as well, namely Flipkart Plus and Amazon Prime. In recent interviews, top executives at both companies pointed to a revival in new user growth, while conceding the slump in 2016-17. “Our new user growth is at 55-60%. Right now, it’s not a problem—new user growth is not a problem at all," said Flipkart chief executive Kalyan Krishnamurthy in an interview on 12 December. Amazon India’s initiatives such as investments in infrastructure, financing, launch of a Hindi version and start of Amazon Easy stores in small towns helped improve the shopping experience for customers, said a spokeswoman in an email. Two factors have contributed to the revival of growth, according to the companies. The first is the fashion category, which easily commands the highest sales volume. Second, a growing number of people in so-called tier-II and tier-III cities and towns are now familiar with online shopping due to faster internet access and wider penetration of smartphones. “The bigger growth is coming from tier-II and tier-III cities. The fashion business for us is so big, that from a pure number point of view, a huge number of new users do end up coming from fashion," said Krishnamurthy. The number of Flipkart’s monthly active users was “less than 10 million in 2017, while it has jumped at least 60%" over the past 12 months, he said. Last week, Mint reported that Flipkart had transaction growth of more than 80% in some months, and the company plans to push newer categories such as furniture and groceries over the next three years. Similarly at Amazon, new user growth has been healthy in the past 12-18 months. 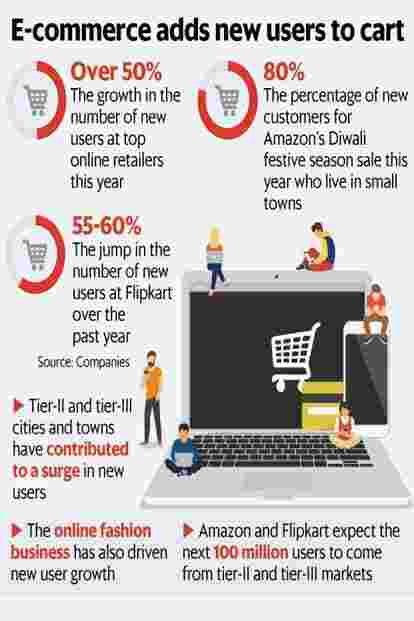 In the Diwali festive season sale this year, 80% of Amazon’s new customers “came from really small towns and our Prime member sign-ups surged nearly three times", said Amazon senior vice president and country manager Amit Agarwal. Over the past year, Amazon has repeatedly claimed it is ahead of Flipkart on metrics such as app downloads, desktop visits and mobile website visits. According to data from market intelligence firm SimilarWeb, which tracks website traffic, Amazon India’s desktop visits continue to be more than those of Flipkart. Experts tracking the domestic online retail business expect new user growth to remain healthy for the next few quarters, primarily driven by faster internet connections, which in turn has led to more familiarity with online shopping among consumers. Heavy investments made by Flipkart and Amazon in discounting, advertising and supply chain expansion have also borne fruit. Flipkart and Amazon are going all out to woo the next 100 million users that they believe will come from tier-II and tier-III markets. Flipkart recently bought Liv.ai, an artificial intelligence startup, which has built a platform that converts speech to text in 10 Indian languages.